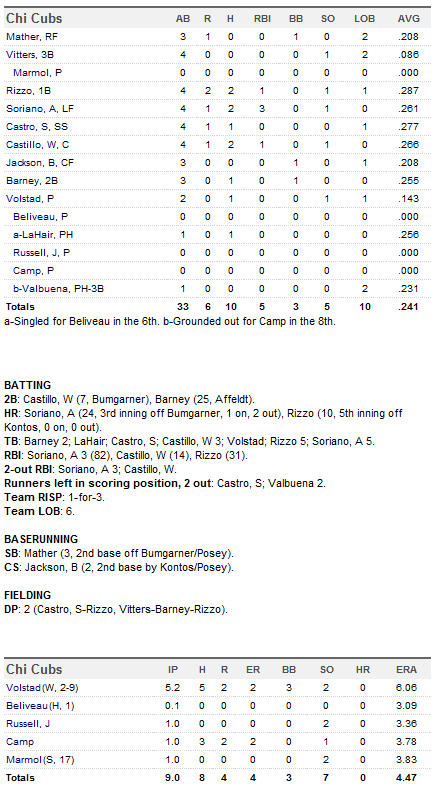 A quick recap of the Cubs minor leagues on Friday, August 31. Peoria was cancelled due to rain and both Iowa and the AZL Cubs seasons are in the books. The Boise Hawks had a few rough innings and lost this one 6-4. Felix Pena pitched five really good innings giving up no runs on four hits with three strikeouts. Hayden Simpson struggled and took the loss giving up six runs on six hits in two innings. Eduardo Orozco pitched well in his two innings allowing no runs on one hit and striking out four. Jeimer Candelario had a nice night at the plate going 2-for-3 with two RBIs. Stephen Bruno and Gioskar Amaya each had two hits, with Amaya scoring two runs. Dan Vogelbach and Wilson Contreras each a had a hit in the loss and Rock Shoulders was 2-for-4 with a double and an RBI. Marco Hernandez delivered a pinch-hit RBI single. Daytona got down early, but Rebel Ridling and the bullpen sparked a 4-3 win. Ridling was awesome on Friday tying the game in the seventh and winning it with a walk-off home run in the bottom of the ninth. He ended the night 4-for-5 with a double, a home run, and two RBIs. Vladimir Frias also had a nice night at the plate going 3-for-4 with an RBI. Nelson Perez had two hits, including a double and a run scored. Rafael Lopez and Christian Villanueva each had a hit in the win. Kyler Burke got the start for the Cubs, he lasted four innings giving up three runs on six hits. Matt Iannazzo pitched the next three innings allowing only one hit and striking out two. Scott Weismann got the win as he threw the final two scoreless innings. 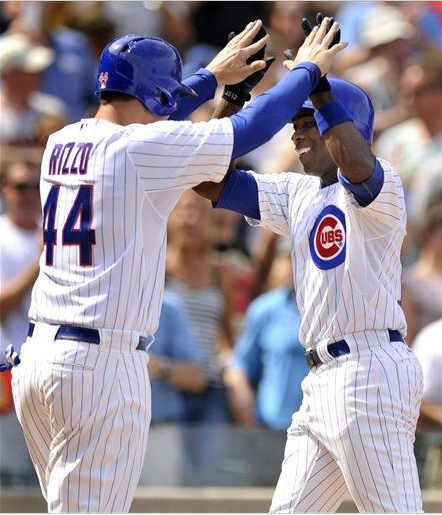 It was a nice win for the Cubs as the season is coming to a close. Tennessee continued to roll on Friday beating Pensacola 5-0. Chris Rusin started, but only lasted three innings not allowing a hit and striking out one. Nicholas Struck pitched the next 5.2 and got the win as he gave up only one hit and struck out six. Rubi Silva had a nice night at the plate going 2-for-4 with a home run and four RBIs. Matt Szczur had two hits in the win and scored a run. Junior Lake and Justin Bour each had a hit and combined to score three runs. Anthony Recker and Matt Cerda each had a hit and Jae-Hoon Ha had an RBI in the win. It has been fun following Tennessee the past few weeks as they have been playing some really good baseball, unfortunately it was a little late as they have been eliminated from the playoffs. The Iowa Cubs were supposed to play a series against New Orleans, but because of Hurricane Isaac the series has been cancelled and their season has come to an end. Maybe Chris Volstad has found something. Volstad went without a win in 24 straight starts, over a full calendar year, he has two wins in his last two starts. Volstad was good today, on a day when the conditions favored anyone with a bat in their hands. He found the zone early and then pitched to his strengths after that, he finished his day after 5.2 innings giving up two runs on five hits while walking three and striking out two. Coming into this one I don’t think many people gave the Cubs a chance, not only are the Giants much better, but the Cubs were facing all world lefty Madison Bumgarner. As they say, that’s why they play the games. The Cubs jumped Bumgarner early, as they scored once in the first and piled on four more in the third inning to take a 5-0 lead. The Giants tried to make it a game late as they pulled within two in the 8th but Carlos Marmol came on to shut the door in the ninth, again, he’s been outstanding as of late. Anthony Rizzo hit his first home run since August 5, no one believed it so they actually had to review it to make sure. Okay, that’s not really why, it was ruled a triple but replays showed it was gone, it was Rizzo’s 10th home run of the season, he finished the day 2-for-4 with an RBI, and two runs scored. Alfonso Soriano also had a big day at the plate, basically rubbing it in the Giants face, “you’ll never get this, you’ll never get this” Soriano was overheard as he rounded the bases on his 24th home run of the season. Soriano of course has said that he would prefer to not play in San Francisco if the Giants tried to trade for him, Soriano finished the day 2-for-4 with three RBI’s. Saturday: Adrian Cardenas, Tony Campana, and Dave Sappelt will be called up. Shortly after that Chris Rusin, Anthony Recker, and Rafael Dolis will be called up. It’s going to be a crowded clubhouse. Big time contenders invade Wrigley today as Madison Bumgarner and the Giants look to keep their quest for a NL West crown rolling. Chris Volstad looks to build off his last start which his best start of 2012, by far, because he won. It was his first win in over a calendar year, he will try to get his second win in the last two weeks today. Here is how the Cubs will line up. 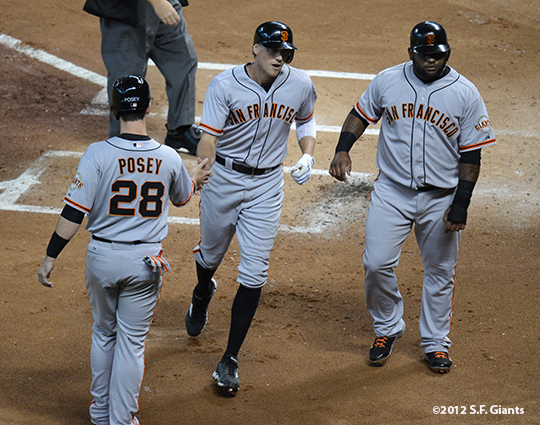 Time to play spoiler as the West Division leading Giants roll into town for a weekend series. Ever since the Giants got the news that Melky Cabrera was going to be suspended they have taken off, and now hold a four game lead over the Dodgers in a race for the Western Division crown. The Giants are getting it done with a balanced attack as they are right in the middle of the pack in runs scored and ERA in the National League. The Cubs are going to need to have a solid offensive approach against the Giants if they want to take this series. The Giants are a baseball team in every sense of the word, they play, and win as a team. If the Cubs can do the same thing, and have an approach like they did in the series finale against the Brewers they might be able to play spoiler. The team could look rather different come Saturday as the rosters will expand, Sveum has cautioned that there might only be six or so call ups, we’ll see, and of course keep you updated. Here are this weekends pitching matchups.